It’s a question I hear often, and unfortunately it’s one I cannot answer. You see, quite often readers reach out to ask if I think their cat has cerebellar hypoplasia or another health issue. While I appreciate their concern and effort to reach out, my response to all of them is nearly always the same: If you’re concerned, please consult your vet. First and foremost I’m not a veterinarian. While I’m familiar with cerebellar hypoplasia because I am a pet parent to two CH cats and have seen it in other cats, I’m certainly not an expert in the medical field. I can provide anecdotal evidence about the condition, and I can certainly offer advice about how to improve their quality of life, but that’s it. Even if I were a veterinarian, I wouldn’t be able to legally answer questions like that over the Internet. Secondly, we are dealing with the Internet. Please realize that sharing a few sentences about a cat’s condition with me conveys very little compared to the diagnosis that a vet can make in person. And thanks to the Internet, a wealth of information is at our fingertips. That information allows us to learn more about conditions, rule out some, and sometimes diagnose others. But self-diagnosing an issue can lead to unfortunate consequences, too. The only true way to find out what’s going on is to take your cat to the vet. This is especially true if your cat’s behavior has suddenly changed, if he had a sudden health issue (like a seizure), or even if you’ve noticed a change in your cat over time. All can be linked to serious health issues. That said, doing your homework online can help. It can give you a number of talking points to discuss with your vet. Now, I know some of you look online for answers because your vet’s knowledge is limited. Unfortunately, when it comes to some conditions like cerebellar hypoplasia, relatively very few vets have actually seen CH cats, let alone know about the condition. 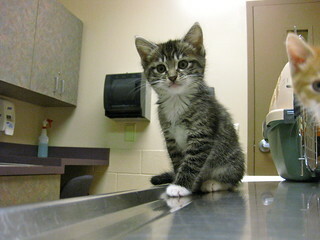 If your vet isn’t as knowledgable as you’d like, I’d highly recommend visiting another vet for a second opinion. If you have trouble finding a CH-familiar vet in your area, consider consulting this map of CH friendly vets. That said, I do want to thank you for trusting me enough to answer those questions. It just breaks my heart every time I’m asked, and I can’t help. Plus, when dealing with our cats’ health, I believe it’s always better to be safe (by recommending folks take their cats to the vet) than sorry. So, if you’re concerned, please consult your vet. Please set up an appointment right now, and while you wait for your appointment, check out the links below. They may give you some talking points when chatting with your vet – but remember to respect your vet’s opinion, too, and of course, if you’re not satisfied with what you’re told, you can always get a second opinion. Good luck! When & How Can You Tell If A Kitten Has CH? Can Cerebellar Hypoplasia Be Officially Diagnosed? My Cat Was Just Diagnosed With CH: Now What? When we first got Stitch and repeatedly had her vet checked we didn’t once hear the names Cerebellar Hypoplasia or Cerebral Ataxia. We were simply told that whatever effected her was neurological, which obviously is correct. Don’t get me wrong, the care she received, and the Veterinary Surgeons and Nurses themselves, were excellent, but we found it impossible to get any clear indication of what was up. It took a lot of google searching of things like “brain injury” or “neurological birth defect” to get any hit on ataxia or CH, and from there we eventually came across your wonderful site Amanda! This has been an absolute gem of information and encouragement for us, two-and-four legged alike. Basically, our vets’ advice in the early days was that because Stitch was in no pain, not deteriorating, and in no immediate danger, we shouldn’t worry and that trying to find an answer would only subject her to invasive procedures that may not have been conclusive anyway. And of course all that advice was correct, and she is still happy, healthy and a lot of fun!